Homeowners understand owning and maintaining a home takes work. We all want to provide a protective, safe and friendly home for ourselves , our family, and all of our guests.When you’re busy working your job(s), caring for your family, and maintaining a home, things can occasionally get missed. Because there’s so much to do around the house this time of year, we compiled the most complete fall home maintenance checklist for our heroes to tackle their fall home maintenance to-dos, and also created a convenient single one-sheet checklist you can download to reference every year to assure nothing is missed. If you’re a first-time homebuyer, this post provides essential information and the free fall home maintenance checklist download is a great tool to keep you ahead of the game. 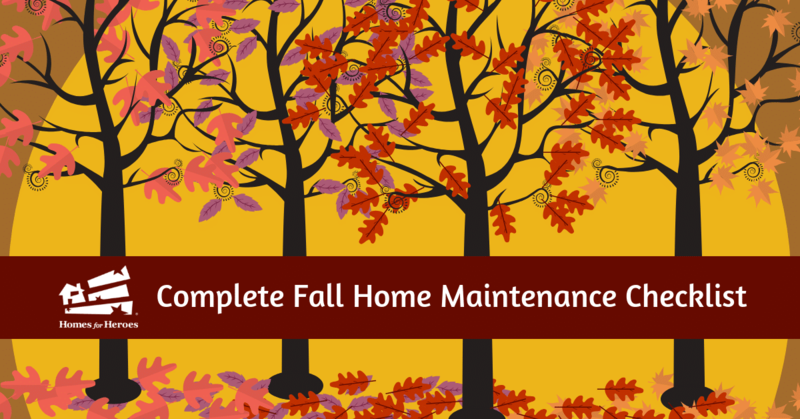 Early fall is a good time to tackle most of these items on your fall home maintenance checklist. It starts with seeding your lawn and refreshing those bald patches. Be sure to water your lawn during this time of year if you’re not getting enough rainfall (in cooler areas with consistent snow over the winter, your lawn will go into dormancy in late September or October and will not need to be watered). Apply a specific fall season fertilizer to your lawn. If your property has fruit bearing trees, take some time to pick up the fallen fruit. Continue to mow your lawn until the first freeze if necessary. If you raised your mower during the summer months, now is the time to lower it back down during the cooler months to between 2.5-3 inch cut. Many recommend mulching leaves with your mower instead of bagging them. You need to be aware of thatch build up over time, but mulched leaves can improve the soil, add nutrients, and best of all save you work! Clearly, if the leaves are so thick/dense you are unable to mow them, you’ll need to rake and bag. Thatch is a layer of dead and living grass shoots, stems and roots that shows up between the blades of grass of your lawn. This build-up happens when your lawn produces more organic debris than it can break down. Too much thatch can cause grass root problems, including root rot and fungus. A great way to prevent thatch build up, especially if you choose to mulch your leaves in the fall, is to aerate your lawn. Always use an aerator that pulls out plugs instead of one that punches holes in your lawn. When the plugs are pulled, you correct compaction and create space. This improves air movement into the soil allowing increased microbe activity. When the first freeze happens you are definitely done mowing, so empty the gas from your mower or add fuel stabilizer, and place it into storage for the winter. When you put the lawn mower away, depending on where you live, that’s the time to bring out the snow blower. Do a system check, refuel, replace spark plugs and oil if necessary and fire up the engine to make sure it’s running effectively. Do you have a green thumb and manage your own garden? If you have perennials (black-eyed susans, purple cone flower, peonies, iris, lily, etc.) this is the time to divide them up, reduce overcrowded areas and replant them elsewhere. It’s also good to cut back your perennials to 6″ above the soil. Many choose to dig up and store the non-hardy bulbs for spring planting. If you’re growing vegetables, this is harvest time of some deliciously hearty vegetables for your dinner table. Gather all of the editable produce and add the over-ripe, rotted vegetables to your compost pile. A preferred practice of many is to cover flower beds with a thin layer of mulched leaves. And, if you are a proud caretaker of roses, you’ll want to cut them back and cover them in preparation of cooler temperatures. Your trees, bushes and shrubs need some attention as well. Helping your trees recover after a long, hot summer is important to their overall long-term health. Continue to water your trees through the fall season, unless you’ve received high amounts of rainfall. Topping off any mulch around your trees is recommended to help nourish soil and provide a “blanket” for tree roots in colder climates. Prune your trees and trim back bushes. By removing dead, damaged and distressed branches you help prevent unwanted insects and organisms from entering. Also, by thinning dense growth, you increase the amount of air and sunlight to be absorbed, resulting in fewer disease issues. Pull out the ladder because these items on your fall home maintenance checklist are on the roof. Take a walk around your roof and give it a good once over. Replace any loose or damaged shingles. Check the flashing around your vents, chimney or skylight to make sure there’s a tight seal. Taking these steps can help avoid leaking problems down the road. And, everybody’s favorite, clean the debris from your gutters and downspouts to help avoid water flowing onto the building and foundation. My first home was in an area with many old, large canopy trees. Loved the big ‘ole trees, but between the sticks and leaves, it felt like I cleaned the gutters every week! If I would have had the money, I would have definitely purchased gutter covers. Might be something for you to consider this year. Take a walk around your house. Note any cracks in sidewalks, the driveway or your foundation that need to be filled. Make sure the ground around your foundation slopes down away from your house. If water does not drain away from your house it can lead to foundation cracks, causing structural instability issues and leaking inside your home. Also, double check to make sure soil does not touch your home’s siding. It will lead to rotting. If you have any retaining walls, make sure they are structurally stable and draining as intended. Haul out the storm windows and doors and replace all of your screens. Take the time to inspect your window and door frames and add stripping or caulk to any cracks or gaps. If your home has central air conditioning, and your done using it for the season, put a cover over the A/C unit to minimize the exposure to weather elements. However, always check the manufacturers maintenance instructions. If your home uses a window A/C unit, cover it with a fitted cover or plastic sheeting. Make sure to dry the interior of the A/C unit by running the “fan-only” mode for several hours when the weather is dry and mild to get rid of excess water/moisture. Again, be sure to check what the manufacturer recommends for your specific unit. These fall home maintenance checklist items are primarily for those of you who live in cold, snowy winter areas. I live in Minnesota and experienced how things can go terribly wrong if you do not turn off water pipes to outside faucets. Short story goes, I was a new homeowner. In the spring, I turned on the sprinkler to water my lawn and left the house to run some errands. When I returned, I found my basement (all of our bedrooms and family area) filled with 6 inches of water because the pipe to the outside faucet had burst. See, the water left in the pipe over the winter months froze and caused the pipe to pop. So, before things start to freeze, shut those pipes down inside your home and keep the faucet open outside allowing it to drip dry. You will also need to drain your pool and/or ponds if you have them. And, if you have one, don’t forget to blow out your underground sprinkler system. Remember to pick up your stuff. If it is done for the year, place your watering hoses, outdoor furniture and potentially your grill in storage to avoid any cracking, weathering or corrosion. Personally, I like to clean and organize my garage this time of year. It amazes me how much crap my family can accumulate over the spring and summer, and how it seems to find a home in the garage. Take some time to put things where they belong and clean the garage floor. If you have a wood burning fireplace, now is the time to cut, split, and stack your fire wood off the ground and cover it up. Last but not least, it’s worth noting if you have others assisting you (aka: kids who lovingly volunteered to help, or not so much) with these outdoor duties, to make sure your tools are free and clear of dirt and other debris after use. Your fall home maintenance checklist also contains some important to-dos inside your home. Continue with your windows and doors. Check if you can feel a draft coming in around your windows and doors. If you can, identify the cause of the leaks, and use the appropriate caulk or sealant to fix those leaks. Your furnace/heating system needs some attention. Replace your furnace filter and contact your local HVAC pro to clean your furnace air ducts and remove lint from the dryer vent(s). If your home relies on a water heating system, you’ll need to drain the expansion tank, check the water pressure, and bleed your radiators. If your furnace will not fire up, here are some furnace troubleshooting tips. If your home has a fireplace (gas or wood burning) some items should be checked and cleaned. If you own a gas fireplace, check to make sure the gas and ignition switches work. Test the fireplace flue for a tight seal. If you’re a new homeowner, or it’s been awhile since you’ve had the chimney inspected, now is the time of year to do it. This is the time of year when fire departments across the country and your local firefighters unite to spread the message about changing the batteries in your smoke alarms. In addition, change the batteries in your carbon monoxide detector. Don’t forget to double check the expiration date on your fire extinguisher too. If you do not own a small fire extinguisher, we highly recommend you get at least one and keep it in the bedroom or bedroom closet where it will be readily available. The areas in your home most prone to fires include the kitchen, furnace area, garage and workshop. Having a fire extinguisher in each of these areas is advised by fire fighting professionals who have battled their share of house fires and know where they tend to start. If your home relies on a window AC unit to cool the house, you may want to remove it. If you choose to keep it in, be sure to seal the gaps where the unit and extension panels meet the house or window frame with weather stripping. You may also need to seal around the inside grill, or even cover it if a draft remains. Check your emergency kits, in your home and in your car, and replace any outdated snacks, dead batteries, and outgrown clothes. Also, test the flashlight to assure it still works. Routine maintenance on a car that gets you home after a hard day’s work is a must this time of year. If car maintenance is not your skill set, schedule an appointment and take it in for a general tune up. Make sure they check the battery voltage, amperage and reserve capacity to make sure there’s enough life left in your battery, and tighten the connections. Good tire tread and pressure are crucial during the rainy fall months and the upcoming snowy winter in cooler areas. Be sure to check your tire wear and pressure. Tire pressure (air in your tires) tends to decrease in cooler temperatures. Make sure your tires are inflated to the tire pressure (pounds per square inch or PSI) noted in your car manual, not the PSI noted on the tires. Double check your front and rear window defrosters to make sure they are working well. Change your windshield wiper blades and consider installing heavy-duty blades if you live in snowy areas. Fill your windshield washer fluid, keep an extra bottle of deicer washer fluid in your car, and remember to put the ice scraper/brush in your car. You may have other needs, but these are the basics: ice scraper, blankets, flares, basic first-aid kit, portable cell phone charger, flashlight and batteries, tow rope, collapsible shovel, rags/towels, basic tool kit, matches, washer fluid, water, bag of kitty litter/sand, snacks, emergency poncho, gloves, extra sweatshirts/socks for every family member, hand/foot warmers, roll of toilet paper, and disinfectant wipes. If you’re thinking about moving, check out Homes for Heroes. Sign up to speak with one of our local specialists, and if you decide to work with them, you can save significant money when you buy and/or sell your home.